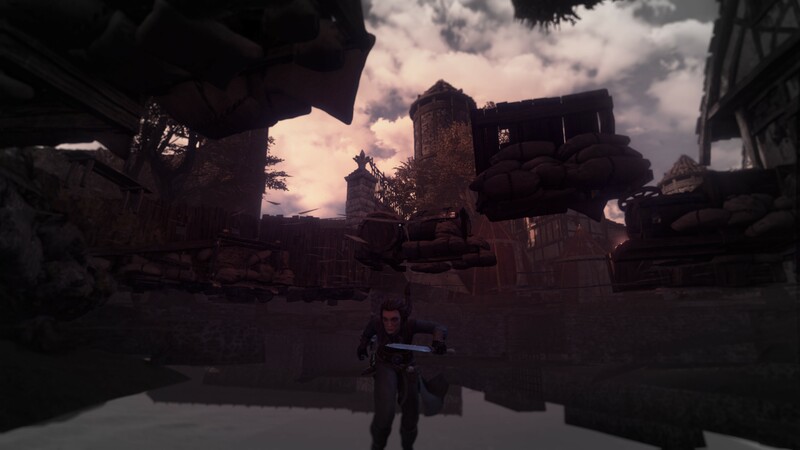 Thanks to Frozenbyte I was sent over a key to check out Shadwen, the brand new stealth game from Frozenbyte that had shown plenty of promise from the demo. The game is beautiful, Frozenbyte really did some good work on the style of the world. The graphics really aren't far off some games with much bigger budgets, so this is a big point in the games favour. It's a really cool idea, and I love games that mess about with the flow of time. You can apparently disable this, but I find the game is much more interesting with it on. You can hold Q at any time to have time progress without you doing anything. 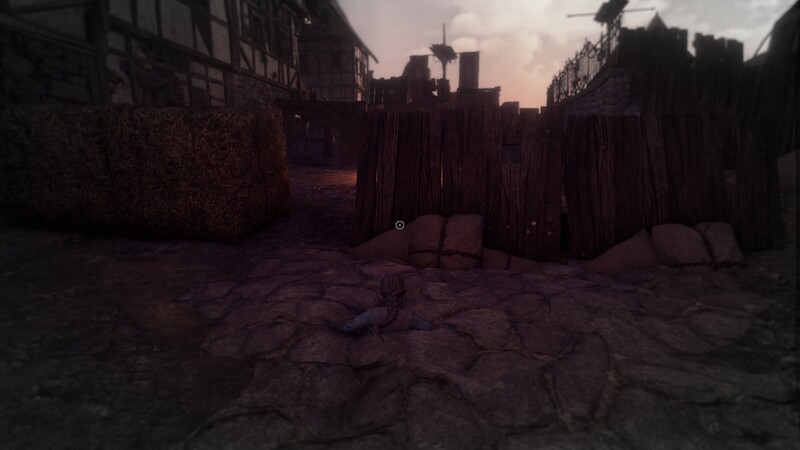 This isn't some run of the mill stealth game either as you need to look after not just yourself, but a starving little girl called Lily you happened to come across and save. It certainly does make the game a bit more interesting, as not only are you distracting guards so you can move freely, but you need to allow Lily a safe passage too. One of the other hooks of Shadwen is the ability to rewind time at any moment of your choosing. The rewind feature is especially cool, so when you mess it up (which I do a lot), you can rewind from where you're discovered back to a safe position to carry on. I love this, as it's an elegant solution to prevent frustration and increased waiting from having to re-load levels. It's effortless to do and works really well. Initially I found the grappling hook quite hard to get my head around. This was due to my mind pushing me to hold down a movement key. The key to this game is to constantly let go of everything, let the game stand still while you take in your surroundings. Throwing the grappling hook, and then reeling it in to pull yourself up is also an interesting mechanic. What I wasn't impressed by, was the lack of ability to grappling hook people from a distance. I honestly thought that could have made for some interesting ways to deal with situations. It wouldn't be an overpowered ability either, since it has such limited distance. I do however love that how you play it affects the story due to what the little girl sees you doing. I love games where I can directly affect the story by going down different paths. It's the whole moral dilemma, to kill or not to kill. You can go for the stealthy approach, but you can also go around killing the guards so you can play it however you fancy. 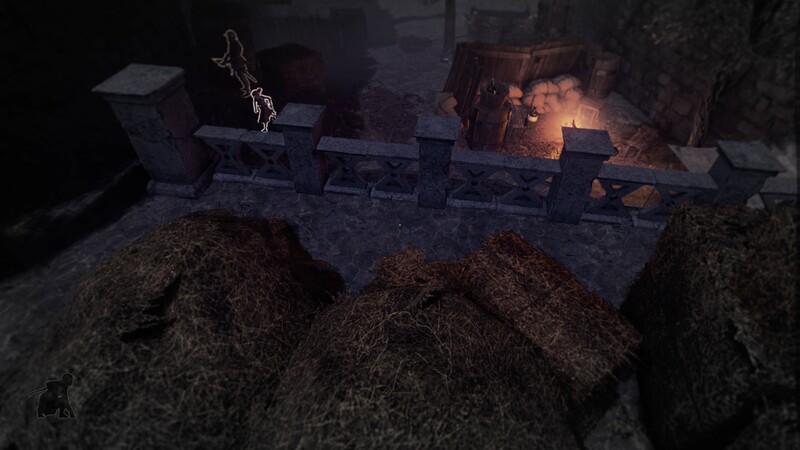 Both ways have their advantages and disadvantages of course, but hiding dead guards in haystacks is quite amusing. As is dropping crates on their heads and setting up traps. 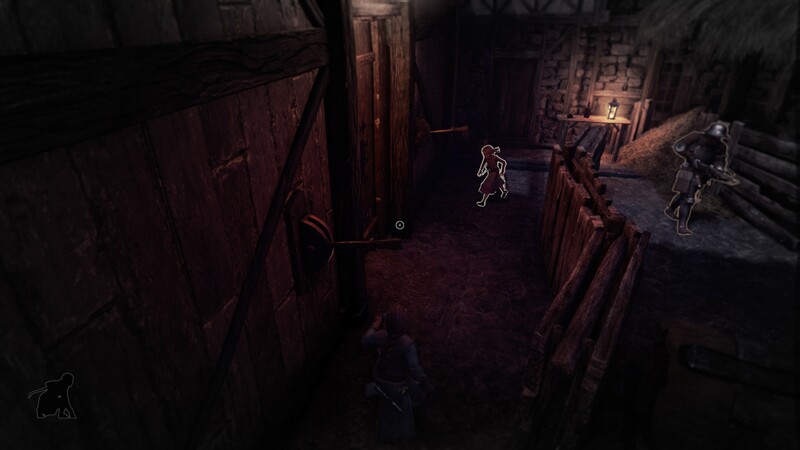 There are elements where I feel the game could have used a little more polishing, like the lever system to open doors, all you need to do is be near them and they magically pull down by themselves with no animation from your character. Things like that break the immersion a bit for me. She's literally right behind him. The AI for the guards isn't the only problem. I've had multiple instances where the AI for Lily is far too reserved in her movement. I've been able to slip past a number of guards easily with time to spare while Lily decided to run away and hide in the other direction. 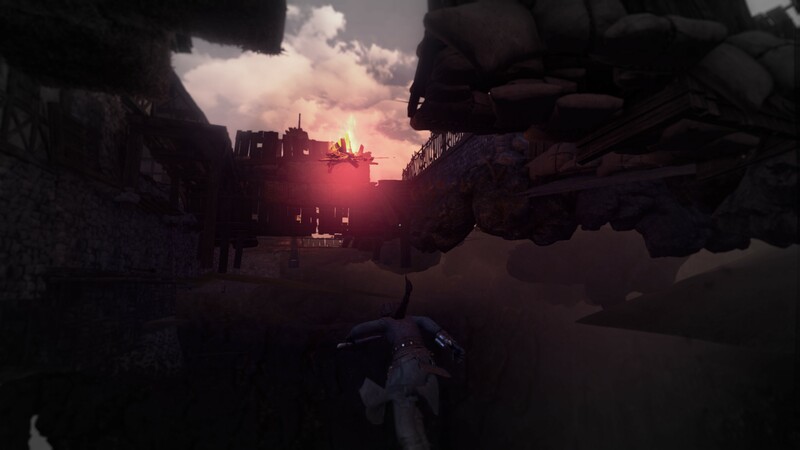 If you can look past things like that, the game is certainly an interesting experience and it can even be quite intense at times as you alert a guard and scramble to either take them out or rewind it to try again. There's more than a few ways to do each section depending on how you get past each guard, and that has made me really enjoy it. It makes you think about your situation often, and you may need to come up with inventive solutions. At one point I was pushing a hay bale behind a guard like a true ninja, then I distracted him by pulling over a crate with my grappling hook to make him move out of the way to investigate it. No game is perfect, so I will highlight some general issues and bugs I discovered. In the second chapter you need to gather bits for a grappling hook. I found all the bits and carried on for a little while but then I had to quit. When I came back I was at the start of the level and it told me to get parts for it, but I already had it. The game wasn't aware I already had it, or it wasn't supposed to save the fact that I had it when I quit. I should note that these other issues below are likely due to me using a 4K monitor, and I have my UI scaled so I can actually do anything. That said, I don't really have issues like this with many other games at all, 99% of games work fine. Also, unless I switch to a different theme the play button doesn't show up until I TAB to it. It's a similar issue to the one I have with Unity3D launchers on Linux Mint as the default Mint theme is honestly terrible with forms (I will soon be switching back to Ubuntu anyway). Still, I do wish game launchers didn't rely on system themes at all. @gamingonlinux Thx for bringing this to our attention, we're working on something that could solve this. Patch might take a while though. Since I run two monitors, the games fullscreen mode is quite broken with it looking like it wants to use both monitors, but only uses one. So I essentially get half of the screen. I was able to overcome this by disabling my second monitor, but that's something I really don't like to do just to play a game (it's also the only game I've ever had to do this for to actually play it, not something I want to continue doing). Fun note: My script to remove screen-tearing will actually solve this issue for me. I turn off my second monitor, load the game and then the fullscreen is fine. I then hit the hotkey I set up for the script which then brings my second monitor back alive with the game still nicely in fullscreen on my 4K monitor. I'm not sure why, but the mouse feels incredibly slow in the menus and just feels completely off. It's like they slowed the mouse down for the menu. Seems to be similar to this issue reported previously. You can only apply the brightness setting in the fullscreen mode, and you can't tweak any of the other graphical settings in-game. Steam Controller doesn't work in-game at all. I have reported all of the the issues to Frozenbyte directly. The game itself is really cool (when you're not falling through the world), but their launcher is pretty terrible. I love games that have launchers, as they do usually make things easier (like picking resolution and monitor), but in this case the launcher just needs to be re-done. If you're looking for a new experience which is pretty well done and you like stealth games, then you should really take a look. Even with the few issues I encountered it's a really fun experience. I do hope they do some AI tweaks to Lily to make her at least a bit smarter with her timing. You can get Shadwen on Steam, GOG and Humble Store. In the demo the left ctrl key allows time to move forwards without you having to constantly jig about, I'll be picking up the full game shortly so I don't know if the developers changed it from the demo. with mate and xfwm i run it with windowed fullscreen and then alt+space and go fullscreen from WM. if i go fullscreen directly it will screw up and will squeeze the game for all 3 monitors with a crappy 16:9 resolution. other than that.. performs amazingly on higest. game is interesting as well but i feel like animations could use some work. Specialy when you use the crappling hook. Quote Steam Controller doesn't work in-game at all. This is unfortunate. I just got a steam controller so I'm trying to understand things that everyone else probably knows. By this statement, do you mean that by default it doesn't work? But it is implied that you can always make a mapping of the controller to the mouse and keyboard yourself, right? And you can always make a mapping of the steam controller to a gamepad right? So hopefully it is just a matter of time until the community comes up with a good mapping? Will they support 4K resolutions properly without scaling? 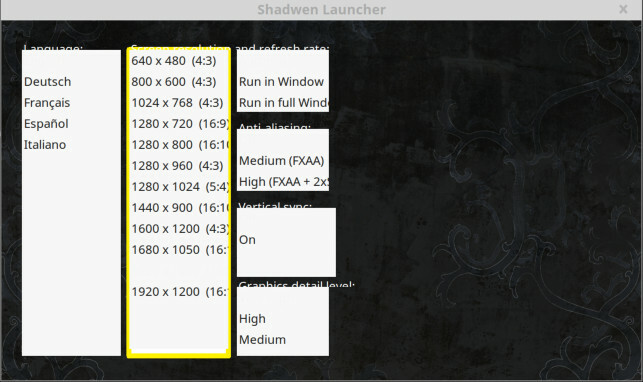 May be it will work natively and it's just the launcher setting UI that doesn't know about more resolutions? It has some other interesting options, like ReduceInputLag and ShowFPS, I'll test those. Setting ReduceInputLag to true doesn't fix UI mouse lag. FPS isn't that high for me on max settings. I get around 25-30 FPS. OK, we are getting somewhere. reduces mouse lag in the UI. @wolfyrion: Did the launcher detect it, or you set it manually in the options file?